D – We are eating at home since there is no choir rehearsal. 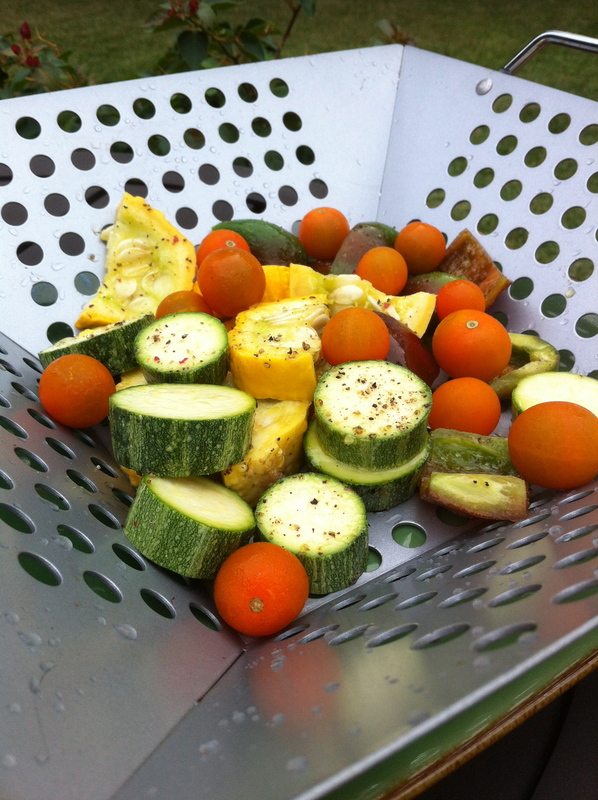 Time to enjoy some more of our FarmHouse produce! Lucky for us, we have a couple of pieces of cheese to start off the evening from our newest culinary find in Austin – Antonelli’s Cheese Shop (www.antonellischeese.com ). Check out the photo and cheese descriptions in Marc’s entry below. M- It’s true. The cheese plate has become a featured staple of fun. Cheese- we have been picking two cheeses with a variety of hard/firm/soft and goat/sheep/cow milk. Wine- something that can go with selected cheese. Our latest wine challenge is to work for the “perfect pairing.” Not only in cheeses, but also in entree. One wine for both courses. Additional treats- usually some nuts, jam, something of contrasting texture or unique adventure. On this tray- Firm bleu and hard Italian cheeses. Almonds. Ginger Peach preserves. Ritz crackers (only cracker on hand). The wine- One of our favorites discovered at Wink Wine Bar- Tommasi Pinot Griggio. It has a unique copper color because the skins of the grapes are left in the “must” a bit during fermentation to add depth to the flavor and changes the color. Fantastic wine. Bonus!! Available at Specs! D- Dinner included rosemary potatoes, grilled veggies (zucchini, summer squash and peppers) in a herb vinaigrette (recipe by Giada De Laurentiis), quick pickled cucumbers (recipe by Tyler Florence) and grilled BBQ pork tenderloin (pre-marinated by HEB). D – Our 23rd Anniversary seemed like a good date to begin – especially after the wonderful time we had at VINO VINO (www.vinovinoaustin.com ) this evening. Plenty of “sipping” and “swirling” going on here! We’ve also ordered several items off of the menu during previous visits – all have been delicious. Perhaps an upcoming entry will share some of our favorites. 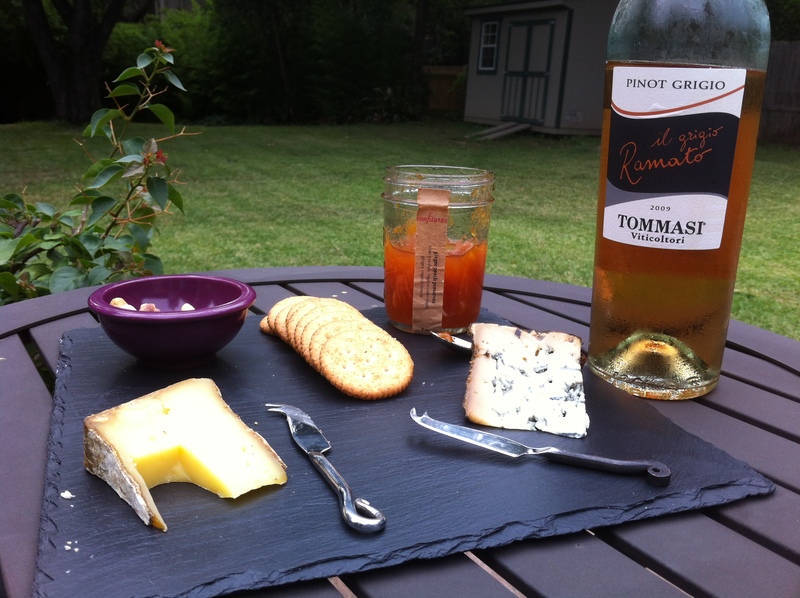 Tonight we started with a fabulous glass of Lambrusco and some Thomasville Tome cheese, served with a tomato-orange marmalade and basil. We decided on VINO VINO for our anniversary dinner because we found out that they serve paella and sangria on Sunday nights. As you can see in the picture, it is presented family style right at the bar. 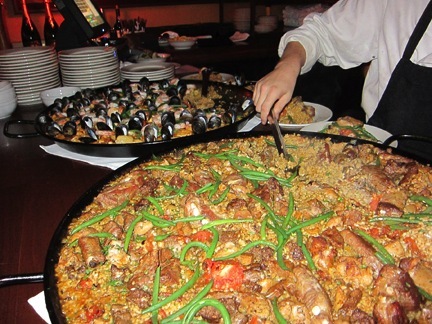 M- Two HUGE paella pans make a grand entrance (two people required for each). One sea food, one meat. Both amazing. Rich, flavorful, hearty, but not too spicy. The chef certainly knows how to create flavors with acumen. I’ve never been to Spain, and this dish didn’t taste American, but from a place I really want to visit….and eat….and sip. 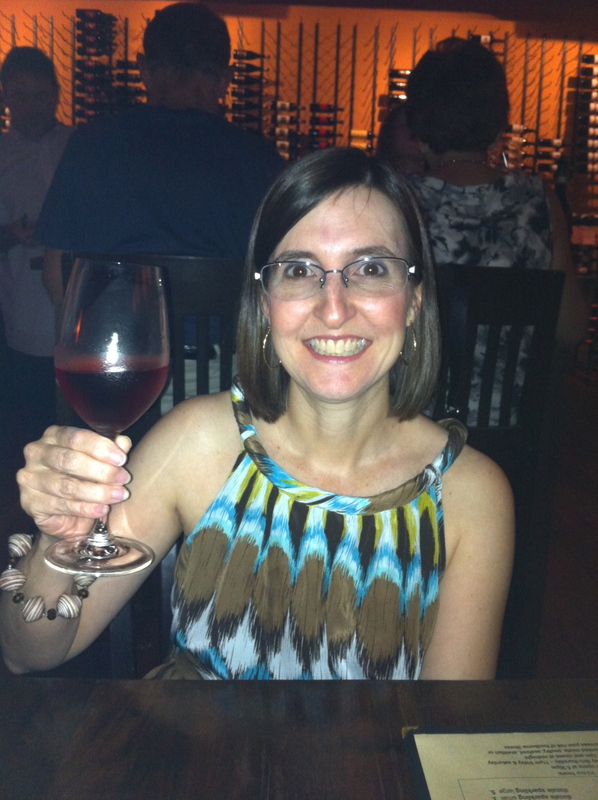 The sangria Vino Vino serves is refreshing and a perfect match for the hearty paella. Some nice wine with fresh fruit, and orange liquor, giving it a smooth, fresh tart appeal with a classy contour. After finishing just a half order each, we continued to sip and let our insides enjoy this tasty delight. But, we also wanted to celebrate with VV’s goat cheese cake. Beyond words how smooth, creamy, luscious this cheese cake is. Paired beautifully with a moscato…half glass…just enough classy sweet to balance and cut the rich cheesy.